The piano tuner's service visit. Your piano technician is expected to arrive in less than 30 minutes. What should YOU do -- or even more importantly, what should YOU have DONE -- before the technician arrives to your front door? Please print out this page, and refer to it one to two days - or even better yet, 1-2 weeks - before your next piano service appointment. Doing so can save both you and the piano technician unnecessary time, energy, and delays, not to mention misunderstandings and money, in both coordinating schedules and performing the job, best. Have your piano's make, type (upright vs. grand), and serial number/approximate age ready. This is one of the most (and in many cases, THE most) important factor a piano tuner / technician takes into account, when determining the price to quote for a service visit. Similarly, a piano, which has more parts than a car [10,000+], requires regular service and maintenance, and demands, in many respects, the same high level of attention and regular care. Side note: A piano's depreciation, when maintained, is far less than an automobile. Therefore, its value is considerable, when viewed from a long-term perspective, and should rightly be cared for and treated as such. Has the piano been moved recently? If so, your piano will need to acclimate and adjust to its new environment. Temperature and humidity levels rise and fall along with the seasons, and with it, so does your piano's pitch. In planning to service your piano, so that it will not slip out of tune so easily after its service, book your appointment in advance, but give your piano a solid >3-4 weeks to acclimate to its environment, before the piano tuner arrives -- unless or course, the piano desperately needs tuning before then, such as for an event or a special occasion. We suggest waiting until this time has passed, prior to your piano tuner's service visit. There are times when a piano, understandably, needs to be tuned the week (or day) of a big event (e.g. party, wedding, outside gathering, etc.). Only at these times, should a service visit be scheduled after it is moved, and prior to the event. In most all other "non-emergency" situations, a piano should be prepped and serviced 1-2 weeks prior to the event, and then 1-2x again, immediately before. Additionally, you may want to schedule a second follow-up visit within another 1-2 weeks, for a "touch-up" tuning, after the piano has been moved. Do you intend for the piano to STAY in the place where it is currently situated? Or, do you plan on moving it to another room or location, shortly after it has been serviced? When moving a piano, even by a small amount, your piano may slightly slip out of tune, both immediately and gradually, in time. Moving a piano can result in an otherwise stable tuning, becoming unstable. In this case, be sure to contact a piano mover FIRST, to arrange for the piano to be moved to its final location. Scheduling a piano mover should take place BEFORE scheduling a piano tuner's service visit. Important side note: Discuss with the technician, IMMEDIATELY BEFORE or AFTER your conversation with the piano mover, the best placement option for your piano, to relay this information to the piano mover, on the day of the move. This will save you unnecessary moving and "re-moving" costs, not to mention another service visit from a piano technician, if the piano needs to be re-moved and repositioned, again. Piano movers are not technicians, and need to be informed from time to time where to set, and where not to set, a piano to achieve the best placement option of sound and preservation. Also, know your piano's caster ("wheel") type (single vs. dual vs. large), and ORDER CASTER CUPS, BEFORE YOUR PIANO IS MOVED, and SET DOWN on THE GROUND. Place sticky notes on the keys that are bothering you. Which keys should be given special attention? Which keys don't work? Which notes sound a little off? Which notes make noise? Make a list of anything you would like for the technician to adjust or take a look at. Do not leave this to chance, to the last minute, or until the day he/she arrives, for you to figure it out. Time is fast and fleeting. And time is of the essence. Make sure that you are adequately prepared beforehand, and have your notes ready. Take notice of and point out any scratches on the piano before he/she begins. Expect the technician to do the same. Unless the technician is performing a full service visit, be sure to bring anything to his attention that may be perceived as being his fault -- and not yours -- but is actually pre-existing. Does the key cover (fallboard), any lids, or boards not close fully or properly or seem to not fit snug? Make a note of any inconsistencies of/on/in the piano, BEFORE the technician begins any work on it. DO NOT schedule ANY other maintenance services, cleaning services, or other personnel (e.g. lawn mowing, gardeners, maids, carpet or tile cleaners, cabinetry or counter top workers, vacuuming, etc.) on the day of your appointment. Your piano technician needs absolute peace and quiet to perform his/her job effectively. DO clear off ALL OBJECTS placed on TOP of the piano. Remove ALL sheet music, trinkets, knickknacks, pictures, 'stuff' and other items from off the piano, and keep them away from his/her workspace. This not only saves the technician time, clearing them off BEFORE (and not during) his/her service visit, but prevents any accidental breakage, damage, or other issues of being mishandled or misplaced (stepped on), from handling these items. [11a] DO clear away ALL OBJECTS AROUND the piano. 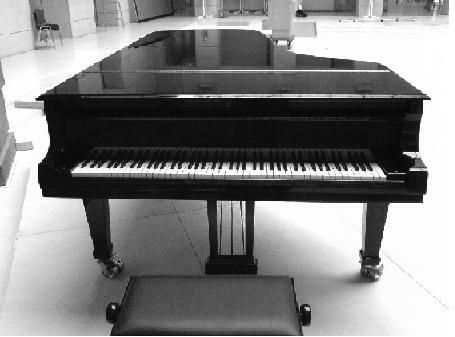 In case the piano technician must remove (1) the top lid, (2) the action (if/when a string breaks, uprights only), (3) the bottom board (upright pianos, only), or (4) the action from a baby grand / grand piano to clean it, or fix any action parts [sticky keys, regulate the action, voice the hammers, etc.] he/she will need ample space to perform this work. [11b] Do you own a grand piano? Be sure to sweep or vacuum under your grand piano in case the technician needs to inspect the soundboard, or make any pedal adjustments, laying underneath. Keep the piano's area adequately lit. There must be adequate lighting and space around the piano to see inside and around it, as well as to place tools on the floor, to work, and to prevent any accidents. Make sure your home / studio is ABSOLUTELY QUIET during his/her tuning time. Turn off all TVs, stereos, radios, computers, YouTube, etc. within earshot of the piano. Tuning a piano demands 100% of the tuner's attention and should not be disrupted by any unnecessary and prolonged noise. Do you own pets? Does your dog bark, unceasingly?... near a glass door or window, within earshot of the piano? Are there any inquisitive children, relatives, or friends who might stop by, who may be interested in knowing what the technician is doing? Make sure ALL animals, children, pets, and other curious 'visitors', are kept at a distance, and clear of the technician's work space, to prevent any accidents, delays, and unnecessary setbacks. After the technician inspects the piano, ask how much time the service visit will require, approximately, before the work begins. Are YOU on a time limit? Do YOU have any appointments, schedules, or errands you must run, which may inadvertently run into the piano tuner's service time, or cuts the allotted time short? Make sure the technician knows EXACTLY how much time YOU have allotted for him/her to complete the piano [100%], before he/she begins. DO ask if he/she needs anything before beginning work (refreshments, restroom down the hall, clear / adequate workspace, more light around the piano, TV off, etc.). Keep all children, pets, and/or other 'visitors' away from the piano during the technician's time on site. The technician's workspace must be clear and free of any distractions, noise, and encumbrances. Keep the piano's area adequately lit. If late afternoon/early evening approaches, ask if the lighting is adequate, before the sun goes down. Please make sure there is sufficient lighting and quiet. Kitchen appliances, ceiling fans, noisy pets, kids screaming or running around can make it difficult for your piano tuner to concentrate. These noises interfere with the vibrations your tuner is listening for, to adequately bring your piano into a stable condition. Ask 20-30 minutes prior to the end of the service call if he/she needs more time, and if so, how much more. Stand over the piano technician, for extended periods of time, as he/she services your piano. If you wish to learn how a piano is tuned and serviced, browse instead such websites as this one, or PTG.org for more information on piano servicing. Do not talk for long periods of time with your piano tuner/technician before, during, or after his/her visit. This may be a hard rule to follow, please bear in mind, piano tuning and servicing requires a tremendous amount of time, enormous amounts of mental energy, and above all, unbroken focus, to sustain and complete successfully. As a friendly reminder: Your piano technician is there for you and your piano. Speaking at length with your technician, however, can extend the amount of time he/she has set aside to service your piano; prolonged conversations can also delay his/her arriving on time to the next appointment. Remember: 100% of the time your technician turns his attention AWAY from the piano, is time YOUR piano is NOT getting attention and being serviced, for YOU. Visiting at length can cost the technician unnecessary (unpaid) time - time that has been scheduled for mostly servicing. Once the technician has opened up the top and/or front lid, front boards, etc., RESIST the urge to CLEAN inside your piano. Surprising as it may be, customers who watch their piano open up before their very eyes, suddenly feel a compelling urge to clean / dust / vacuum inside. While much dust has accumulated from many years (decades, in several cases) of being unopened and uncleaned, simply stand back, relax, and allow the technician to perform his / her job. Please do not try to 'intervene' or assist, unless specifically asked to do so. If you have any questions or concerns, be sure to ask your technician before he/she leaves, before scheduling your next appointment. Be patient with your piano technician, and allow him/her the allotted time necessary - without interruption - to complete a solid, stable, and meticulous tuning, regulation, or voicing for you to enjoy, year round. Schedule your next service visit before the technician leaves. Your piano requires regular servicing, the same as your automobile does. Pianos outnumber technicians >20:1, per day. Book your next appointment, here. Play your piano BEFORE your technician leaves. What's right with the piano? What's wrong with it (if any)? What subtle and major differences do you notice? Does the piano respond/sound better, or worse than before? Please play and test out your piano, before the technician packs up to leave. Point out any observations, questions, or concerns you may have. The most expensive visit of a piano technician, is the one where he/she travels BACK to a customer's location, to adjust something that could have been noticed, remedied, or adjusted -- by the technician or the customer -- BEFORE the technician left. Heeding these guidelines can result in a better outcome overall for you, your piano, and your piano technician. Pianos require a tremendous amount of time, energy, patience, and attention to detail. Once the work has been completed, even in incremental steps and stages, the end ensuing result can be both felt and heard, and is greatly enjoyed by the musician and listeners. In most cases, the difference is noticeable, immediately. It may be the noisiest few hours (both tuning/voicing) of your entire [service visit] life, but this is to ensure the piano holds its proper pitch and voice for the longest possible period of time, for your betterment, enjoyment, and life.